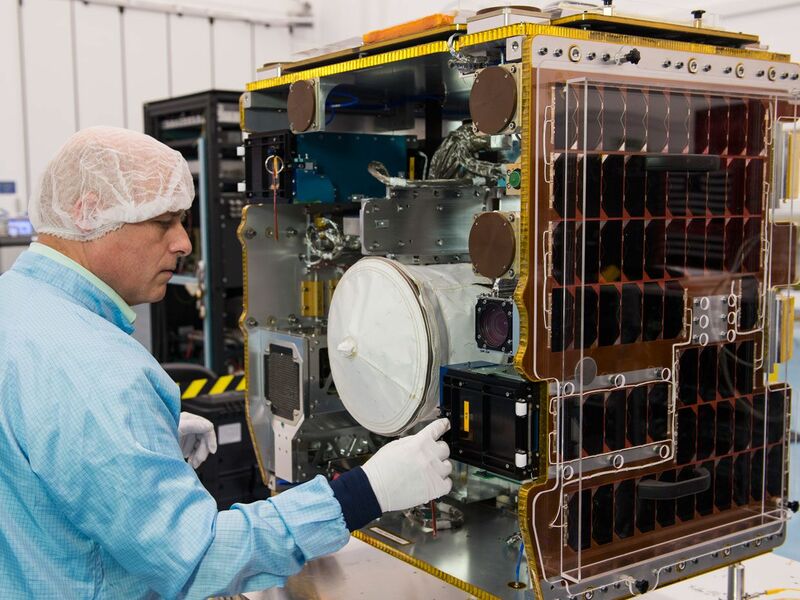 Showtime: Prior to its April launch, a technician applied the finishing touches to the RemoveDebris spacecraft. A spacecraft may soon be able to snare space junk by firing harpoons and nets. A European mission was expected to begin tests in late May of space-age versions of those ancient tools to clean up Earth’s cluttered orbital lanes. Space junk has already destroyed at least one satellite, damaged others, and periodically forces the crew aboard the International Space Station to take evasive action. There are more than half a million pieces of space debris larger than a marble and tens of thousands of significantly larger specimens left over from spent rocket boosters and defunct satellites. To head off future catastrophe, experts from NASA and the European Space Agency have proposed removing 5 to 10 large pieces of debris each year. For the new mission, plainly called RemoveDebris, collaborators launched a 1-cubic-meter spacecraft to the space station in April. The spacecraft was scheduled to deploy from the space station in May to complete four tests of technologies, including a net and harpoon, that could be used to clear space debris. “The net and harpoon are simple concepts but uniquely implemented for this application,” said Guglielmo Aglietti, principal investigator and director of the Surrey Space Centre at the University of Surrey, in England. Other researchers have proposed using lasers or electrified cables to nudge space junk into orbits that lead it to burn up in Earth’s atmosphere. A Japan Aerospace Exploration Agency attempt to test an electrodynamic tether failed in 2017 because the tether was unable to unroll and deploy. Several other missions have tested passive removal, which involves aged satellites using their own boosters or deploying drag sails to force self-immolation. Given that limited history of testing, the US $18.7 million RemoveDebris mission could prove instructive as a low-budget demonstration. The European Commission and the ­Surrey Space Centre are leading an international consortium backing the mission. If successful, the project could inspire a follow-up mission that will try to capture an actual piece of space junk, said William Schonberg, an aerospace engineer at Missouri University of Science and Technology who is not involved in the effort. “Hopefully, we will not have a disaster that costs human lives before we have the combined will to do something,” he said. Go Fish: In one test, the spacecraft will toss out a net to snare a CubeSat. For this test, the main spacecraft will release a CubeSat about the size of a bread loaf that will deploy and inflate a 1-meter balloon to make itself into a larger target. Once the CubeSat has drifted 6 meters away, the main spacecraft will launch a 5-⁠meter-wide net at the target. If all goes well, weighted masses on the net’s edges will wrap it securely around the target. Motor-driven spools will tighten the neck of the net to prevent the CubeSat from escaping. The entangled satellite will then be left to fall out of orbit and burn up in Earth’s atmosphere. But future missions could also allow the spacecraft to reel in its netted prey. Clean Patrol: The 100-kilogram RemoveDebris spacecraft must now prove its ability to capture space junk. Any space-debris removal will require the ability to accurately track floating bits of stuff. The mission’s second test involves a vision-based navigation ­system that uses a pair of cameras and a lidar sensor to follow potential targets. The two cameras will ride aboard the mother ship and perform two sets of observations. First, the cameras will observe the net-capture experiment involving the first CubeSat. Then the cameras will turn their focus onto a second CubeSat, equipped with four extendable solar panels, that will deploy from the main spacecraft. Eventually, that CubeSat will drift out of orbit and burn up in Earth’s atmosphere. Bull’s-Eye: A tethered harpoon with a pointed tip zooms toward its target in this conceptual rendering. In the harpoon test, the spacecraft will not attempt to spear a tumbling target moving along its own trajectory. Instead, it will extend a long arm to hold a stationary target, about the size of a ping-pong paddle. Once the target is in place at a distance of 1.5 meters, the spacecraft will fire a small harpoon that consists of a miniature projectile the size of a pen with a trailing tether. The tether will allow the spacecraft to reel in its target. It may sound simple, but it’s a necessary step in demonstrating how well a harpoon could perform in real space conditions. A Fiery Demise: In another test, the spacecraft will deploy a sail to gracefully descend and burn up in Earth’s atmosphere. The final test will prevent the spacecraft itself from becoming yet another piece of space debris. This test involves raising a drag sail on the end of a mast that will extend to 1 meter and ensure that the sail doesn’t entangle the spacecraft. Once the sail’s mast is ready, a motor will raise carbon fiber booms that open the sail’s membrane, which measures about 10 square meters. The drag sail will act as a large brake, making the main spacecraft leave orbit faster and bringing the mission to an end.